Daniele Baldelli is a DJ & producer who is considered an innovator in the Italian disco scene for developing a unique, 'funky' and 'tribal' aesthetic by playing eclectic, esoteric records at drastically altered speeds, often slowed way down, and sometimes adding drum machines and effects. 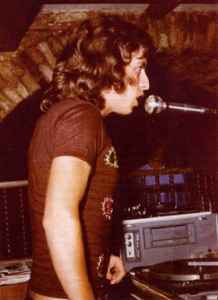 He developed the style with Claudio "Moz-Art" Rispoli while both were resident DJs at the Baia Degli Angeli (1975–1979) and Cosmic (1980–1984) discothèques in Northern Italy; he released scores of mixtapes during his tenure at the latter. He was mostly unknown outside of Italy until a surge of English-language press coverage in the second half of the 2000s spotlighted Baldelli's and T.B.C. (4)'s 'Cosmic' style alongside the similar 'Afro' style of his rival, Beppe Loda. Shouldn't all Original Cosmic Tapes be liste for completists sake ? (think they are 100+ in total, at least).